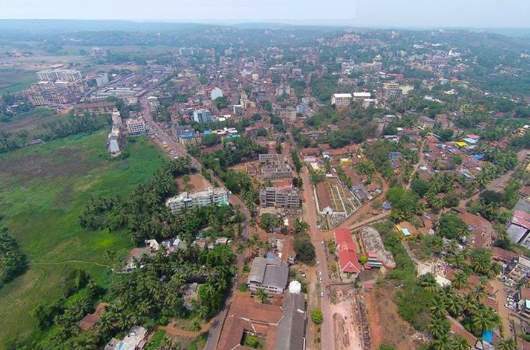 Mapusa (pronounced as Mapsa by the locals) is Goa’s third largest town and the capital of the northern Bardez taluka. It is mainly a market town for the surrounding beach areas of Calangute, Candolim, Anjuna and Baga among others. Even its name is thought to be derived from the Konkani word for a measure – “map” and the phrase ‘fill up’ – “sa”. It is a fairly small town with mostly modern building spread around the slopes of a small hillock called Altinho. It lies about 13 kilometers from the capital city of Panaji and on most days there is hardly anything to entice the casual visitor to its environs. Local Goan specialties such as spicy sausages (chouriços) and the Goan spirits such as toddi and cashew feni are much in demand amongst locals and outsides. Another item to look out for is the magnificent banana crop from the nearby village of Moira. Most of the items are sold after a few rounds of bargaining and the prices are usually much lower than anywhere else. Most of the items are piled up in heaps on the sidewalks, with most of the vendors being colourfully dressed womenfolk from the nearby villages who come here to sell their produce. The market also draws a large number of foreign tourists from the nearby beach areas that come here to stock up on their provisions. Mapusa does not have many tourist sites worth visiting. There are a few colonial era Municipal building on the Altinho hill, a fairly modern temple of Lord Hanuman just a few minutes from the main bus stand and most importantly the Church of Our Lady of Miracles about 2 kilometers east of the market area. The church is also known as St Jerome’s locally and dates back originally from the year 1594 when the first edifice was built. Since then it has been rebuilt several times, most recent reconstruction being in 1961. During the Liberation of Goa that year, the Church was razed by a fire which was allegedly sparked off when the retreating Portuguese army tried to blow up the nearby bridge to stall the advance of the Indian army.